Performing Arts magnet Broad Ripple High School in Indianapolis, IN is most well known for being the high school attended by talk show host David Letterman. A close second for Broad Ripple's claim to fame is its $1.1 million acoustics and AV renovation in the school's auditorium, including sound reinforcement equipment from Electro-Voice. Wright Consulting began on Broad Ripple High School in Indianapolis, IN by designing new diffusion panels for the walls and proscenium, to provide tight integration with the EV Xi systems specified. 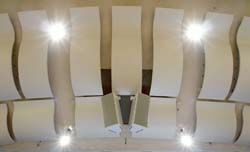 Architects Browning Day Mullins and Deirdorf were commissioned for the acoustical renovation in 2005, and hired Indianapolis-based acoustic and AV consultants Wright Consulting Associates to specify the new sound system. The original system could no longer keep up with the school's growing performance demands, especially with regard to the low-end needs of hip-hop. "The original 1950s room and subsequent acoustics had been modified and compromised over time and the room was not performing for music, drama, video, or common speech applications. The original audio system only provided coverage for about one third of the depth of the room," explained David Wright of Wright Consulting Associates, on why EV Xi loudspeakers were chosen for the new 1,000-seat auditorium. "In fact, a near riot occurred when the old system could not project enough SPL to provide crowd control during one particularly raucous student event." "Wright Consulting began this project by designing new diffusion panels for the walls and proscenium, to provide tight integration with the EV Xi systems we specified," said Wright. "Room reverberation and musical support was enhanced by both these custom diffusion panels-which cover up the old absorption material and wall 'fuzz'-and the use of EV dipole technology." Wright Consulting Associates installed high performance Xi-2153 loudspeakers with an Xi-1152 delay ring for accurate, uniform projection. EV dipole allowed low frequency control that was required to keep lobes out of the pit and off the stage below, plus off the acoustic panels above the speaker. "All this added up to deliver the predictable clarity and low-end response the students had been sorely lacking; they do a lot of hip-hop and it's hard to get an audience to respond to a performance if they can't feel the bass. This isn't an issue any more," said Wright. The project was unusual for Wright Consulting, as they faced no compromises in integrating professional sound with professional acoustics. The room boasts SPLs capable of exceeding 95 dBA continuous, with full fidelity and high speech clarity for all manners of applications. In addition to the two Xi-2153 triamped cabinets and the Xi-1152 biamped cabinets, the install also included the following EV products: one Dx38 2 x 4 DSP, four Sx80 speakers for onstage use for Theater in the Round System, one Polar Choice podium microphone with variable patter selection, six RE97 headworn wireless condenser mics, six ND767 handheld mics, and three Force floor monitors. The install also includes a Telex Audicom 2-channel intercom system.